Oil seals work to retain vital lubricants, and exclude harmful contaminants, allowing sensitive bearings and components to operate in a clean environment. In dirty or dusty environments particles can infiltrate the seal, and contaminate the oil lubrication film, forming a damaging abrasive. This process can result in grooving or polishing of the shaft, both of which will prevent the oil film seal working properly. This results in a leaky seal or contaminated lubricant. The traditional repair method is to either replace the shaft, or remetalise the worn area. These alternatives are expensive or time consuming. 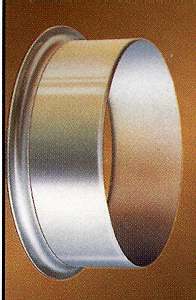 The shaft repair sleeve is a high quality, thin wall stainless steel sleeve that is slid onto the shaft over the damaged portion. This operation takes a few minutes, minimising plant downtime. The sleeve is so thin that the replacement seal used is normally the same size as the original, and the finish of the sleeve is precision machined to provide an excellent sealing surface. SEALMASTERS can supply a range of repair sleeves in sizes ranging from 12mm to over 1m diameter.